House, 2 Queen Size BR + Loft + Den, 2 Baths, (Sleeps 4). Adults Only. Serene mountain home overlooking Big Buck Creek. Enjoy the sounds of a rushing (certified) trout stream and the Nantahala Forest while relaxing on the screen porch or taking a dip in the hot tub. A mountain retreat at high elevation. Convenient to the Appalachian Trail and many favorite hiking trails (with waterfalls!) for all different skill levels. For shopping, fine dining, scenic drives or even gem mining, you are in the right spot. The owner can make recommendations or suggest an itinerary upon request. Gambling is available in Cherokee. Cashiers, Highlands, and Franklin are all within a short drive where great shopping, dining, arts/crafts, live music, and even summer theater can be found. Our nicely appointed, comfortable home sleeps 4 adults comfortably in two private suites. Two full sized futons are also available in the loft. The well supplied kitchen, with wine refrigerator, accommodates any gourmet cook. Outdoor grilling with al fresco dining on the deck or screened porch makes every meal special. The interior 18 ft ceilings with exposed timbers and expansive glass doors and windows provide a tree-top mountain experience. Every interior direction brings the outdoors in with the beauty of the hardwoods and mountain laurels. Enjoy a Scandanavian wood burning stove as you relax in the living room. Kiln-dried, seasoned fire wood is provided. The downstairs suite has a wonderful gas fireplace wrapped in the native stone. Due to rushing stream, Nantahala Forest Wildlife & hot tub, etc., We Do Not recommend our home for children or physically impaired individuals due to gravel & steps...making mobility very challenging. The property is located about 2 1/2 hours driving time from Atlanta and only about an hour from Asheville. If it is rest and relaxation, surrounded by scenic mountains, you want.... our Big Buck Creek home is the home away from home for you! Amenities include Dishwasher, gas stove and cooktop, refrigerator, washer & dryer, shower, hot tub, sheets, TV/DVD/ and phone along with a CD player. 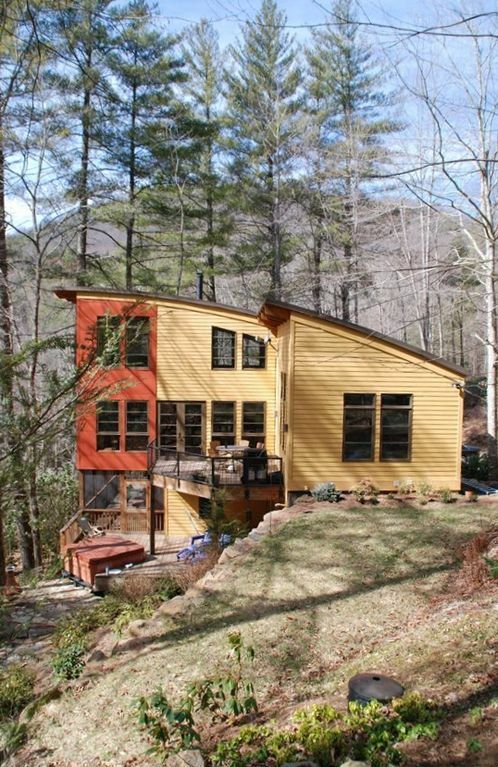 We are busy professionals in Atlanta, GA and love our get-a-way abutting the Nantahala Forest. We purchased the Buck Creek property in 2001 when it was an elaborate "Swiss Family Robinson" campsite! The former owners had enjoyed it as such when their children were young. It also sported a small single-wide trailer and a large deck overlooking a beautiful, rushing creek. A few years later we traded the trailer for excavation work and constructed the home of our own design, doing much of the finish work inside ourselves. It was a labor of love and we've enjoyed sharing it with family and friends since our first Thanksgiving in 2003. SUMMER: On our mountain it is always at least 10 degrees cooler than Atlanta and there's nothing like the screened porch and hot tub after a summer day hiking. There's a real, old fashioned swimming' hole just a little way up the private road with stone steps leading down to it. AUTUMN: Of course, fall is the busy season as this is one of the top leaf looking areas in the country. WINTER: If you're from an area where it never snows, you're in for a treat. Our private road is gravel and usually passable in all but the heaviest of storms. The State Road is also cleared of snow promptly and well-maintained. Surrounded by the beautiful Smoky Mountains. It was such a nice place tucked in the woods. The house was built with a lot of thought and had a great vibe. Loved listening to the sound of the creek. I can’t wait to come back and stay again. This traveler was so respectful of our house rules and extremely tidy upon departure. We greatly appreciate the special attention they gave to caring for the home. It was almost like they had not been inside yet their note of appreciation confirmed they enjoyed their stay. Thank You, Thank You for loving our home as much as we love it in the Nantahala Forest. We hope you will return. Carol & Katie. Not sure what to add to prior reviews that does not sound redundant, but felt compelled to write a review, as we enjoyed our stay very much. To start with, Carol was really helpful before we even left. She answered a number of emails with trivial questions and seemed to be happy to do so. There have been ample reviews that speak to the beauty of this home, especially the natural light afforded by TONS of windows everywhere in the home. Add to that trees right outside the windows with brilliant fall foliage colors, and it was an amazing sight to wake up to. The beauty and sound (roar) of the creek right below the back of the home was one of our favorite features. We enjoyed the quality: nice pots and pans in the kitchen, comfy sofa, Weber propane grill, great selection of knives and flatware in the kitchen, great gas cook top and oven, quiet dishwasher, nice fridge with bottom drawer freezer with ice maker, hardwood throughout, etc. There is a bed room with ample blankets and spread, and comfortable pillows. A large common area with sectional sofa, wood stove, kitchen table and kitchen stocked with dishes. The bathroom on the main level is large and attractive with double sink, a fabulous tub (Japanese soaking tub?) and lots of quality towels. A door off of the common room opens to a deck with table and chairs for 6, and propane grill. Lower level has a large bedroom with thermostat controlled fireplace and lovely, roomy bathroom with gorgeous stacked stone shower. Outside of the downstairs bedroom door is a screened in back porch with breakfast table, 2 chaise lounges and a glider that brings back great childhood memories. Outside of the screened porch is another deck with the hot tub overlooking the roaring creek. The loft has a television with internet television and two futons. There is a shed on property with firewood for purchase, about $6 per bag.This was really convenient and we enjoyed the Scandinavian wood stove. We saw a closet with lots of puzzles and so on, but we never got around to that. We drove a short distance to catch multiple waterfalls. The following day we made another short drive to Bartram Trail and did the short hike from Wallace Branch to Williams Pulpit (4 miles round trip-highly recommend). One of our favorite experiences was eating lunch in Highlands at Mountain Fresh Grocery Store. We highly recommend this home and hope to return and enjoy other seasons. A beautiful place off the beaten path with the wonderful sounds of a creek. The property is modern and clean. It’s also off the beaten path and so there’s not any traffic. Kids can play with no worries. There is a gorgeous creek that runs below the house. It provides a great sound of rushing water that is soothing. The hot tub was a bonus that helps you to relax. We would definitely come back. Amazing mountain home nestled in the trees! This home was absolutely amazing! Exactly what our family was looking for in the mountains of North Carolina. The stream was wonderful and can be heard from anywhere on the property. There is an awesome swimming hole just a short walk up the road. Like being in a luxury treehouse! We will definitely be back. Thanks! My wife and I thoroughly enjoyed our four day getaway at Buck Creek. It was all that was advertised and more. Carol was most helpful with getting us in at the last minute. The house is situated in the perfect spot along a small creek that gives a constant water flowing sound for supreme relaxation. You have porches, patios, and views that will keep you relaxed all day. What a neat place. I hope to return soon. Reservations during peak seasons (April - November) require a 7 day minimum stay. All other dates require a 3 night minimum stay.